Toby's Resort Is A Charming Property Situated On The "Hip Strip", Close To Nightclubs, Duty Free Shops and of course, Montego Bay beach. 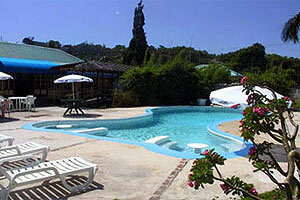 Toby's resort is a charming property situated on the "hip strip", close to nightclubs, duty free shops and the beach. The Doctor's Cave and Cornwall beach are only a few minutes stroll away from this hotel. This small, family-owned hotel caters to the adventurous tourist, as well as its many returning guests who seek a peaceful and relaxing environment. Toby's resort is set on two acres of tropical gardens and fruit trees. The property features two swimming pools onsite, as well as two bars and a restaurant on the property. Toby's resort is located just a mile from Sangster International Airport.